Late last year Allerta! visited OA’s Workshop to see how the props for the Company’s new production of Mozart’s The Magic Flute, which opened at the Sydney Opera House this month, were coming along. Originally created for the Met in New York, by Tony Award-winning designer/director Julie Taymor, this Flute is a visual extravaganza filled with extraordinary puppets reminiscent of those that populated Taymor’s other hit production, The Lion King. The man responsible for building the puppets is OA’s Head of Props, Mat Lawrence.“In this Flute, the props are beyond the norm,” he says when we meet in Workshop, where a collection of astonishing creatures are in various stages of coming into being. There are giant polar bears, a nine-metre-long serpent and a giant goose that will fly across the stage with the help of two puppeteers holding it from the ground. “We had to ensure that artists would be able to interact with the puppets without getting injured; and we did so by making the puppets as light as possible,” Lawrence says. The goose, for example, is made of aluminium, silk and fibreglass. Besides safety, there were technical issues to be considered. For instance, the serpent that meets his nemesis in the three ladies – large enough to fill the full width of the stage – had to be able to do 2.5m turns. “Getting that right was quite an achievement!” Lawrence laughs. Props is used to working closely with Scenic Art, but in this production it also had to enlist the help of Wardrobe, which sewed together all the silk puppets. 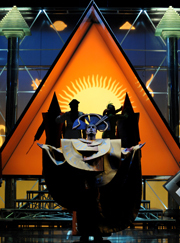 Opera Australia’s production will play to houses in Sydney, Brisbane and Melbourne, and the Props team thus had to ensure that the puppets, designed by Taymor and Michael Curry, were suited to each of these venues. “With every show that we do, we have to bear in mind the requirements of the venues where it will be performed,” Lawrence says. Making sure that the large Flute puppets could be operated within the confines of the small Opera Theatre at the Sydney Opera House, took some head-scratching. Flute has also been demanding in that it has an unusual amount of props, scenic elements and large costumes that have to be stored in a small backstage area, in a way that ensures the safety of the performers who share the space. Once the puppets had been built, they were fitted to puppeteers. Lawrence ensured that these artists – dancers all – were comfortable in their harnesses. “It’s crucial that the puppeteers’ movements are in sync with those of the puppets, that they become one entity, almost,” he says. "You want sequins? You got sequins!"